Brooke has been happily married to her college sweetheart for fifteen years. Even after the C-section, the dog poop, the stomach viruses, and the coffee breath, Scott still always winks at her at just the right moments. That is why, for her beloved, romantic, successful husband's fortieth birthday, she is giving him pictures. Of her. Naked. Samantha's newlywed bliss is steamrolled when she finds shocking evidence of infidelity on her husband's computer. She has been married for two days. She won't be for much longer. Katherine works eighteen hours a day for the man who irreparably shattered her heart fifteen years ago. She has a duplex on Park Avenue, a driver, a chef, and a stunning house in Southampton, and she bought it all herself. So what if she has to see Phillip every single workday for the rest of her natural life? Brooke, Samantha, and Katherine don't know one another, but all three are about to discover the conquering power of friendship—and that they have all they could ask for, as long as they have one another. Finally, a book that made me cry! Trust me, it was a good cry. 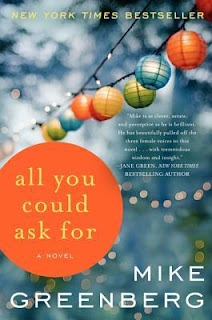 All You Could Ask for by Mike Greenberg touched so many high points of emotion for me. I devoured the pages. One characteristic of all of my favorite books are different points of view that change with each chapter. In All You Could Ask For, I felt like there was the perfect mix of interesting characters, all with their own unique story to tell, but at the same time each story had a magnificent common thread that knit the novel together as a whole. An author who tackles the characters finding how what makes life worth living is a brave one and Greenberg succeeds. What happens when 3 women, leading 3 completely different lives, all find each other walking down the same, scary road? I don’t want to give too many details but must say that the battles they are facing are heavy wars many many women face and the stories never cease to tug at my heart. Facing a health problem, growing older, or infidelity are all scary things and the characters in this book handle all of their situations with grace, attitude, and charisma. During their individual stories, Samantha, Brooke, and Katherine find each other on an online support group. That’s when the book really took off for me. I loved watching them warm up to each other (and even when they showed some tough love, too). I was rallying for them to find strength in each other when they needed it the most. I think mothers should make their young daughters read this book to teach them what strong women act like. They handle their lives with poise, there is amazing examples of true friendship and good deeds and there’s more bravery in this book than most put together. If you are in the mood for a empowering book, if you appreciate the impact of true friendships and need to be reminded what sheer bravery looks like, read All You Ask For.